by coie - March 8th, 2009. 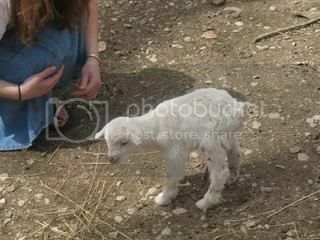 So being the observant farmer wannabe that I am, I was suprised when dad sent a picture to my cellphone (I was running errands) which had a brand spankin’ new baby goat in it. *ahem* I had no idea Gee was “with goat”. I think Willow and Daisy are too. Roys, we are still hoping your goat will uh, help us out with the other does. Anyways, his name is Milo. Ain’t he cute?! « We Did Work, Honest! Hey, Melonie! That is my line! Er, Miss Mel… it’s true. There is an unwritten law somewhere which declares MammyPie’s claim on any word or word phrase with “Pie” attached to it. i loved your comment on my blog. It made me smile and I agree that it is MUCH better that you are ‘Auntie Coie’ rather than ‘Cousin Coie’ to Eden.. 🙂 I’m so glad you get to be one of the first people who she sees after her arrival! He is adorable! I love those all-white goats. They are so pretty. Whatever you do, don’t boil that baby goat in its mother’s milk! Mr. Fritsch, you have my word. Say, when is the gang going to come down for a visit? We miss you all!